It’s a spring night in Las Vegas. The smells of pan-seared, fresh-baked, deep-fried, seasoned, sautéed and flambéed illuminate the Garden of Gods Pool Oasis at Caesars Palace Las Vegas Hotel & Casino. This is The Grand Tasting at Vegas Uncork’d, where the world’s culinary pros gather. A star-studded crowd rushes in with a beaming appetite. Giddy celebrity chefs are running around, posing for pictures like old pals. It’s impossible to go five steps without tasting a bite of the highest grade Japanese wagyu beef. Or the most tender piece of freshly grilled Spanish octopus. Or the gooiest nibble of chocolate ganache cake. These culinary stars are here to experiment, dishing out fresh creations to people who are here to try something new. Here, it’s clear that Las Vegas is home to one of the world’s most culturally and stylistically diverse food scenes. And we’re all ready to indulge. But wait! Try to name a Vegas celebrity chef in the ’80s, or even the ’70s. Struggling? Vegas has always embraced those who push boundaries and live outside the ordinary. But our food scene hasn’t always been viewed as a testing ground for world-class chefs. In 1931, our rep was ramping up. Gambling was legalized. Easy divorce laws were set in place. And construction on the Hoover Dam drew attention to the area. The East Coast was moral. But Vegas was mesmerizing. People flocked. New people meant new casinos. In the ’40s, places like The Last Frontier, Thunderbird, El Cortez and El Rancho Vegas sprang up around Fremont Street and the Strip. And with them came the infamous “chuckwagon,” or buffet. The Wagon Wheel Tavern was one of the first. It opened in 194, nestled inside El Rancho Vegas. Owner Tommy Hull wanted to create a paradise for weary travelers in the middle of a barren desert. And part of his vision was a Hollywood Western-themed buffet. The advertisements for The Wagon Wheel Tavern would give you a good idea of what these all-you-can-eat places were like. They beckoned “wranglers,” enticing them with thick cowboy jargon: “double-barreled value of the year!” and “lasso a fresh crisp salad!” Compared to today’s elaborate spreads, the food was basic − cold cuts, salads and a selection of “hot entrées.” If it wasn’t the easygoing food or overwhelming advertising, the prices ($1) and the hours of operation (24/7) would presumably get your mouth watering. Over time, these smorgasbords became known for their shrimp cocktails, T-bone steaks, ribs and crab legs. Still, prices stayed low and operating hours stayed abundant. Now, buffets in Vegas are everywhere. And are still a favorite. The options have undoubtedly upgraded. Take the Bacchanal Buffet at Caesars Palace for example. Ninety percent of the food is prepared right in front of you and plated in single portions to up freshness and cut waste. The term chuckwagon doesn’t seem to fit these establishments anymore. We retired the name. But the concept lives on. What do Anthony Bourdain and Flavor Flav have in common? They both have enjoyed true Italian meatballs at The Bootlegger Bistro, which is Nevada’s 32nd Lt. Gov. Lorraine Hunt-Bono’s restaurant. The best part? Their visits weren’t exclusive. You could literally be sitting at a table next to one of them, covertly snapchatting your best friends. Stars and everyday people have been sharing meals at Las Vegas’ red sauce joints and steak houses for years. Hunt-Bono’s parents opened Venetian Pizzeria downtown on Fremont Street (the precursor to The Bootlegger Bistro). As with others like it, Venetian Pizzeria was small, tight-knit and family oriented. She says “Mama grew things like rosemary and fresh basil in her small garden” to use as ingredients in her restaurant. Naturally, authenticity was cooked into the DNA. Ironically, it drew a high-profile crowd. Hunt-Bono remembers, “Sammy Davis Jr. would pull up in his limo with all of his giant body guards … he was so small. … He’d get out of the car himself, walk right in, check his pizza, and say, ‘Looks great, Mama!’ He’d hand everyone a hundred-dollar bill and be on his way.” Performers from the Strip would saunter in after a shift, reenergize with a helping of mama’s spaghetti and treat lucky patrons to an impromptu show. The Golden Steer Streakhouse is an iconic Rat Pack hangout that you can still visit today, where small-town vibes meet big-name stars. During the Rat Pack era, on any given night, you’d probably find Frank Sinatra there sipping a blended Scotch whisky and serenading patrons. He and his pals Dean Martin, Sammy Davis Jr., Peter Lawford and Joey Bishop made it one of their go-to places for dinner, drinks and a little debauchery. As time went on, visitors changed but the restaurant kept its charm. 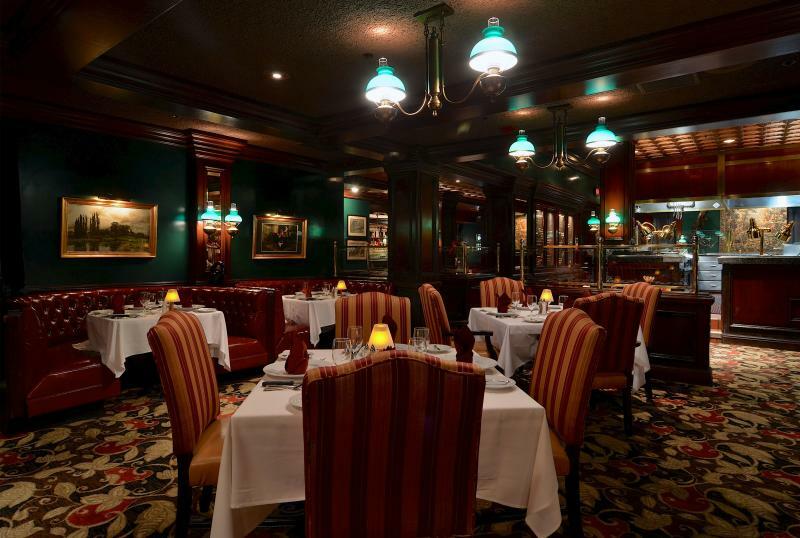 That unique feeling of familiarity and awe is what continues to define the beloved Vegas steak house and Italian eatery. But where does it come from? The Rat Pack-style spirit of the “old Vegas” lives on at places like The Bootlegger Bistro, Golden Steer, and Ferraro’s Italian Restaurant and Wine Bar. But they aren’t the only places that you can get your fix. Piero’s Italian Cuisine, featured in the movie Casino, became another stomping ground for Rat Pack types and politicians in the ’80s. With it, places like Chicago Joe’s and The Steak House in Circus Circus have all made their way through history and carry with them the stories of the past. Once, “gourmet room” meant white tablecloths, dinner shows, tuxedos, ball gowns, chandeliers and multicourse meals served by waiters who felt more like butlers. This era in dining started in the 1960s when an increasing number of eyes on Las Vegas woke the entrepreneurial spirit of a couple dreamers. A lot of people agree that Major A. Riddle brought gourmet rooms to the Strip in 1961. Riddle knew how to create a buzz. He started by inviting 6,700 locals to the Dunes’ grand re-opening in 1956 for free food and dancing. Next, he scheduled Minsky’s Follies, a risqué showgirl act, for a run in the showroom. Unfortunately, this isn’t one you can still visit. The last meal at The Sultan’s Table was on January 26, 1993, when the employees were invited to enjoy a free prime rib dinner before Dunes closed for good. In 1966, Jay Sarno became Caesar of the Strip. He was the mastermind behind Caesars Palace. Sarno’s fantasy for a royal empire included greetings by Cleopatra, Roman décor, palm leaves fans, massages from goddesses, and other, you know, general royal treatment. Entertainment was at every twist and turn of the property. And that extended to the culinary experience. “When Caesars initially opened, it was where every man could feel like a Caesar … you could just walk into the restaurant and get amazing food. … In its Bacchanal Room (gourmet room), there was a menu, but you could order anything,” says editor-in-chief at Wendoh Media and author of many articles on Caesars Palace, Melinda Sheckells. At the time, entertainment attracted people to Vegas. Not food. So how do you get people into your fancy restaurant? Usually, a dinner show would suffice. But Sarno dreamed up something else. “There was a long-standing rumor that, originally, Jay Sarno wanted to have a piranha pond in the middle of the restaurant. So the bussers could empty the food into the pond and the piranhas would eat it and it would become part of the show. The food was the spectacle, but a great way to keep the customers happy, to offer them something extra special,” says Sheckells. Unfortunately, that didn’t happen. Luckily, the royal treatment was enough to attract a significant crowd. Gourmet rooms existed elsewhere too. Pamplemousse Le Restaurant is a great example that you can still visit today. But what really struck a timeless chord is the idea from Sarno’s Bacchanal Room at Caesars Palace that we can all be royalty. With this, he helped transform the perception of the city − from a gritty, Wild West town, to a more refined, cosmopolitan destination. In the early 1990s, celebrity chef Wolfgang Puck’s L.A.-based restaurant Spago was doing well, and it was time to expand. But where to? Vegas wasn’t quite known for chef-made fare. But Puck saw potential. “We took a chance 25 years ago to bring Spago to Las Vegas at a time when the city had never been exposed to fine dining quite like it,” says Puck. He was a pioneer. Spago really struck a chord with what was going on food-wise on a national scale. And that illuminated a direction for Vegas’ culinary scene. He had to train the buffet-sized appetite to prefer roast Cantonese duck and wild mushroom risotto over Caesar salad, baked potatoes and prime rib. And that he did. Every detail of Spago stayed true to his vision of quality. The wait staff was charismatic. The interior design was cutting edge. The food was fresh, seasonal and tasted like perfection. Vegas was on its way to a culinary overhaul. 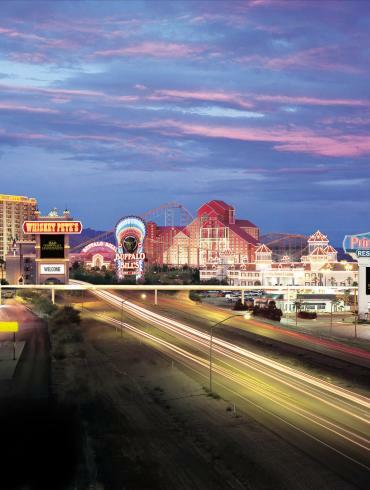 Visitation to Vegas during the ’90s nearly doubled. The city was exploding with growth. And Steve Wynn was the city’s major player and culture-shifting powerhouse. He started with The Mirage in 1989, and continued building casinos through the ’90s. He opened Treasure Island Hotel and Casino and Bellagio Las Vegas, to name a few. Bellagio Las Vegas was created in the American dream of European decadence. The art, the accommodations, the fountains and the food became a synchronized fairytale of luxury and whimsy. To accomplish his lofty vision, Wynn needed expertise in food and beverage. And he knew just where to get it. Elizabeth Blau was a recent grad of Cornell School of Hotel Management graduate program and working with the legendary Maccioni family in New York. Wynn recognized her ambition and determination, and knew that she could bring a lot more to Las Vegas. He made her an offer she couldn’t refuse. She would be Bellagio Las Vegas’ food and beverage guru. Together, Wynn and Blau paved the way for the celebrity-chef capital that Vegas was becoming. In the later ’90s, celeb chefs from Food Network’s Too Hot Tamales and owners of Border Grill, Susan Feniger and Mary Sue Milliken, were looking for a place to expand their restaurant. Vegas was hot on the list. “I’ve known Wolf forever and went to see Spago when they first opened. I was blown away. When I saw the volume of people there, who were not only going to buffets, but also looking for great food and interesting cocktails my image of Vegas back then shifted,” commented chef Feniger. They felt our culinary scene’s transformation. It was catching up to the draw of the casinos and esteemed shows. “I loved the energy, from early in the morning when I was walking to get my first coffee, till very late at night. People were there to have fun, and of course to gamble, but you could see there was a demand for something more and the hotel feel and vibe was changing too. I found it invigorating,” said Feniger. In 1999, Feniger and Milliken opened Border Grill in Las Vegas at Mandalay Bay, serving up gourmet Mexican fare. “When we first opened, we were in the middle of nowhere… we thought there would be more business. By year two, we started to see things shift pretty dramatically. We learned. And started to understand the customers who come to Las Vegas,” said Feniger. And those customers were latching on. “What we find is that people do come back. And I’ve heard it so many times: ‘I come to Vegas twice a year and my first stop from the airport is always Border Grill,’” said Milliken. Vegas is constantly redefining itself as a culinary destination. We’ve always been super accessible. Especially now with an unprecedented amount of celebrity chefs per square mile. Anyone can grab a table at the five-star restaurant they’ve been dying to try. It seems that any food critic or culinary expert couldn’t deny Vegas as a foodie city. And we certainly are. Take internationally recognized chef Lorena Garcia who, in collaboration with John Kunkel’s 50 Eggs Inc., recently opened Chica, in The Venetian Las Vegas, their newest hand-crafted concept. 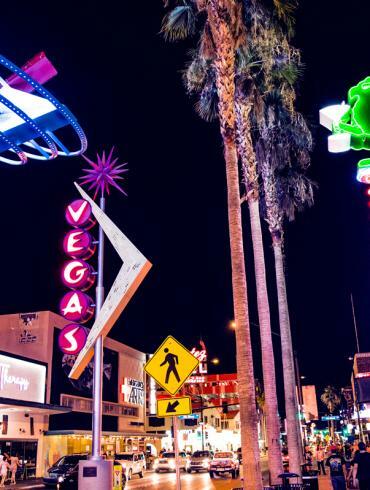 “In Las Vegas, you have this foodie culture where (people) go and enjoy. They give you feedback. They really enjoy the mixology program that goes hand-in-hand with the food. It’s this entire experience. And that, to me, that’s what it’s all about − being able to have a restaurant in a place like that,” says Garcia. It’s that unrestrained ability to innovate that attracts the “club of the culinary titans” that Garcia describes. For chefs, “When you go to Vegas you feel like you made it. … I couldn’t dream of anything else,” says Garcia. Standing in the middle of The Grand Tasting, you can see that Garcia is just one of many chefs proud to call Vegas their home. Today, if you’re searching for a place to eat on the Strip, you’ll come across big names like Gordon Ramsay, Bobby Flay and Hubert Keller. You’ll have the option of treating yourself to dinner Searsucker by Brian Malarkey or at Giada by Giada De Laurentiis. You’ll get to pick which Guy you prefer − Guy Fieri’s Vegas Kitchen & Bar or Restaurant Guy Savoy. And you’ll get to decide between José Andrés’ Wagyu Beef Cheeks, Buddy Valastro’s Marsala or Nobu Matsuhisa’s Foie Gras. This has always been a place where visitors take chances. And now, our chefs are taking chances too. You’re always welcome to indulge, to try whatever’s next.